In a large mixing bowl, using a mixer on medium speed, beat butter and cream cheese until creamy - about 1 minute. Beat in sugar, 1 teaspoon lemon zest, lemon extract, vanilla extract until well combined - about 1 minute. Reduce mixer speed to low and beat in lemon juice and flour until just combined. Chill cookie dough in refrigerator for 30-45 minutes or until cold and firm. Roll out shorbread dough on a lightly floured surface to an 1/8-inch thickness using a rolling pin. Try to roll the dough into a perfect rectangle. Cut off some of the raggedy edges, if necessary. Cut dough into squares; transfer to cookie sheets. In a small bowl, rub together remaining 1/4 teaspoon lemon zest and 1 tablespoon coarse sugar, using fingertips. Sprinkle over tops of shortbread. Bake 12-15 minutes or until very light golden brown. Transfer shortbread to wire racks to cool. 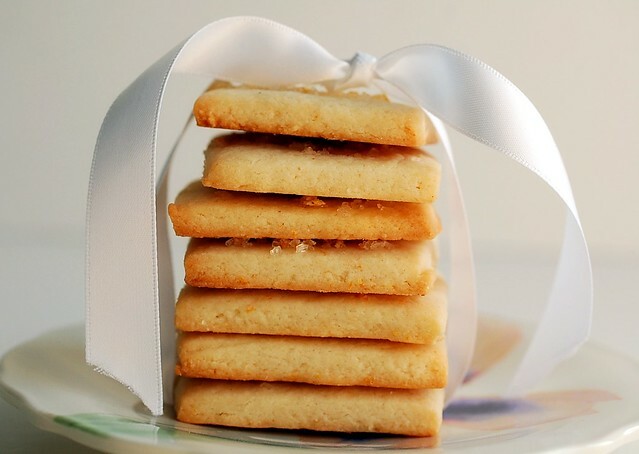 37 comments on "Meyer Lemon Vanilla Shortbread"
so sorry the concert was like physical abuse...yikes girl. I HATE shows like that and have bailed on some b.c of it. Ugh. Kerrygold butter. I just won some in a massive KG giveaway and blogged about all the butter and cheese I have now! I love all those pictures. Sorry to hear there were so many rude people at the concert. I know it would tick me off!!! The shortbread looks so tasty...so good with coffee! I love these cookies. It's probably a burst of flavors. Vanille and lemon, so good togheter! That's really too bad about the concert but the rest of the trip sounds like it was fun! I agree, concerts are much more enjoyable when you have a seat. Those cookies look delicious! I recently made your lemon icebox cookies and think I might have to try making these ones as well! Cheers! I've had the same experience at concerts. I wanted to get up close to see some of my favorite bands and ended up getting pummeled! The worst was when a crowd surfer kicked ne in the head! Glad to see that you survived, and were able to make some delicious shortbread cookies. The lemon sounds like it would really cut the richness and butteriness of the cookie well, without taking away from the overall flavor! Delicious! Sorry your concert experience wasn't a pleasant one - it still looks like you had a nice trip though! Meyer lemons are pretty special and yes they are still available. they look delicious! I've just recently fallen in love with meyer lemons, so these look perfect. and I agree about Kerrygold - it's the BEST butter ever! Totally worth every penny. Not only do those cookies look delicious but I went and saw Cold War Kids in Chicago a couple weeks ago!! I'm glad there is someone else out there who shares a love for them!! There were rude drunk people at my concert too if it makes you feel better! I love Kerrygold-it's the best! Great shortbread recipe! Ugh I am SO sorry you had to deal with that! I saw the Cold War Kids in concert last year and it definitely wasn't that bad. Probably because I stood in the back. And huddled. In fetal position. Hmmm. Alright totally beelining to every Trader Joe's in town to find meyer lemons. This shortbread sounds delicious! Those shortbread look so springy! I've been meaning to bake something with Meyer lemons forever- I'll have to give these a go! So glad you opted to go out for dinner. I travel a lot for work and room service is NEVER worth the cost!!! I was just in Columbia two weeks ago. My boyfriend is going to grad school there, and we spent a couple of days in the city. We ate at Shakespeare's, too - great pizza, but our service sucked. Maybe it was an off day. Those cookies look awesome, too. I'll have to try them if I can find some Meyer lemons. Yum! Kerrygold Irish Butter is the ONLY butter I buy! You won't believe what a difference it makes in literally everything from toast to baked goods! Love your trip recap. My very first apartment was near the Capitol Building in Jeff City and I could see the dome lights from my bedroom window. Loved it. 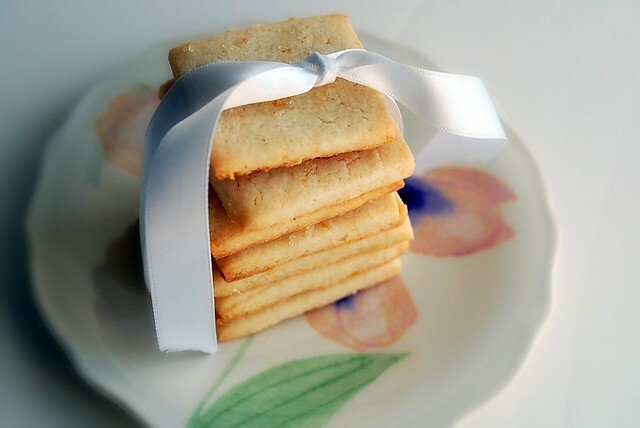 These shortbread cookies look amazing and I think they will be on my list for Easter for sure. Yummers. It's not easy to find Kerry Gold butter around here but I have had it and it is wonderful. Sounds like you had a good trip overall! These cookies look and sound wonderful! Hooray for Kerry Gold butter....it rocks! Also hooray for the shortbread. I'm totally digging the meyer lemon addition. I'm jealous that I can't seem to find them anywhere around here! Those look like tasty little treats! Wow, that was a jam-packed post, Em! I LOVE the portraits of you studying the menu and in profile with the plastic cup. So gorgeous. Shortbread is not my favorite, but if I liked it, I would LOVE these. 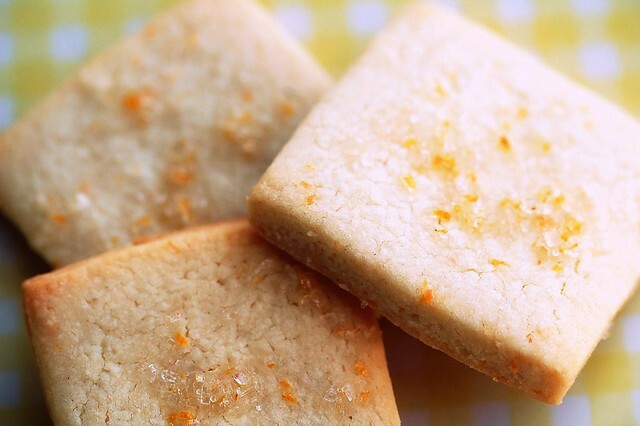 Shortbread, Meyer lemons AND Cold War Kids? I'm jealous. Too bad the audience ruined the show for you. Anymore I only go to 21+ shows in small venues because the audiences tend to be less horrible. I'm from the Midwest.. Davenport, Iowa actually. So Hy-Vee is our staple grocery store around here. They are everywhere. Any new grocery store is exciting when you visit it for the first time, but trust me it's a grocery store! And I can never get Guittard chocolate in our stores.. lucky! I love love love shortbread. I'm amazed sometimes that something so simple can taste so good. I want these cookies NOW. Kerrygold butter rocks. So do Guittard chocolate chips. Can't wait to see how you use them. Sorry you had such a bad concert experience. At least you got to pose with the band! That was awesome. A few months ago Kevin and I went to a Citizen Cope concert and we had a similar issue. There were so many rowdy drunks making a ruckus and acting like teenagers. What made the whole experience worse was the thought that these people were going to get into cars and drive away after all of that drinking! You know what the second rowdiest audience I ever saw was? The Indigo Girls! I kid you not. ooh, these shortbread sound awesome! love the cream cheese in there. and i still have meyer lemons in my fridge ;) it's like a complex, i've bought them every time i've seen them this year!! I too, still have some Meyer Lemons that need to be used. Perfect recipe for that! i've ALWAYS wondered why panera offered bread with their bread bowls! it's insane! 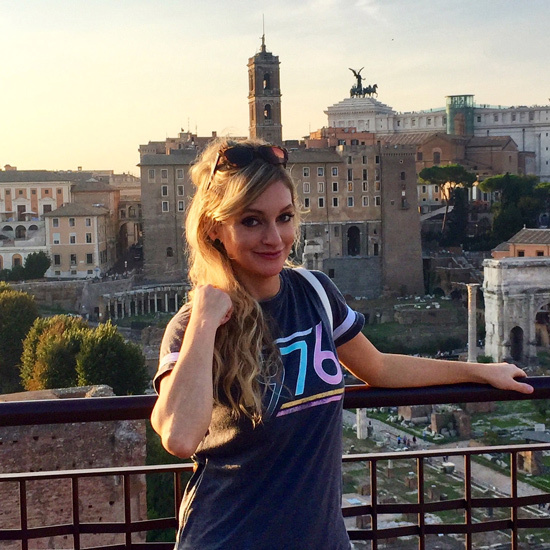 on a more reasonable note, fun road trip--thanks for sharing the pics! If you think you're getting old because you don't like being physically abused at a concert ... I've never heard of that band. Which must make me really, really old! But I've heard of shortbread and yours looks delicious! PS: My son LOVES Panera's soup in a bread bowl. You can get just a bowl of soup without the bread bowl. I heart Guittard chocolate! Their milk chocolate is the best and tastes excellent in chocolate chip cookies (especially when sprinkled with sea salt). 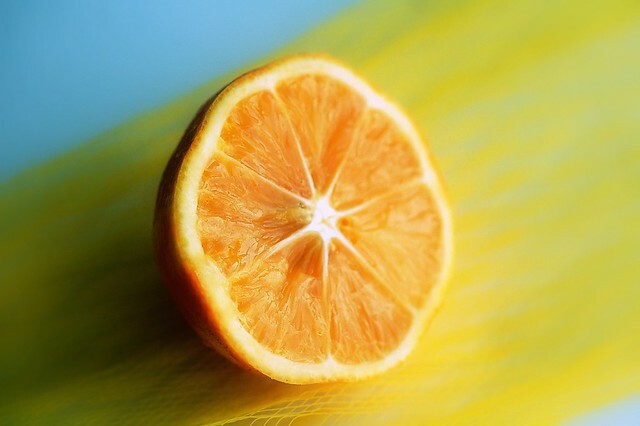 I love anything lemon! These cookies look so good. I would love to have them with a mug of hot tea please! Sorry you got beat up. I tried being in the front at a concert once and fought my way to the back for safety and sanity reasons. At least you got to meet the band afterward! 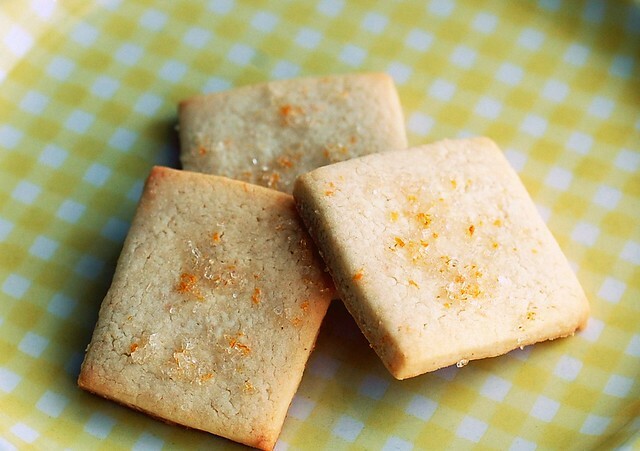 Love shortbread and lemon-my mouth is watering right now!...will try these soon! No Hyvees in Minnesota yet...probably too cold here! Also, yeah. Concerts at the Blue Note are not for the faint of heart. Drunk rude people = 95% of Columbia when school is in session. Kacey, I thought about that! It was spring break... were you there? That's awful! I don't think I would like living there, then. But ohhh the HyVee! I can't afford it either, haha. We will. I'm not sure if we'll be back anytime soon though.